Cacio e Pepe — Oh Wonderful! The joys of vacation quickly came to an end tonight when I stepped back into my apartment, which welcomed me home with frigid 58 degree arms and my stupidly loud upstairs neighbors who never stop walking and seem to sleep only 4 hours a night. To top off this frigid homecoming, my fridge was also completely empty, except for some half and half, cheese, and one bottle of beer. A fridge only a single white-male would envy. When you take tired and add lazy into the mix, you end up with a quick search through your empty fridge, but less empty freezer and decide to whip up a dish that you’ve been liking on Instagram for too long without actually cooking. With literally just four ingredients (cheese, pasta, butter, pepper), and one of my new All Clad pots (thanks D + J! ), a warm and cheesy meal was born and my homecoming turned out to be just fine in the end. Although most recipes of Cacio e Pepe call for Pecorino Romano cheese, Parmesan served as a suitable subsitute this time around. Maybe next time I’ll be energized enough for a run to the grocery store. 1. Bring water to a boil with a dash of salt. Cook pasta for 9 minutes or until just barely soft. 2. Once pasta is cooked, drain pasta and reserve 1 cup of pasta water for Cacio e Pepe sauce. 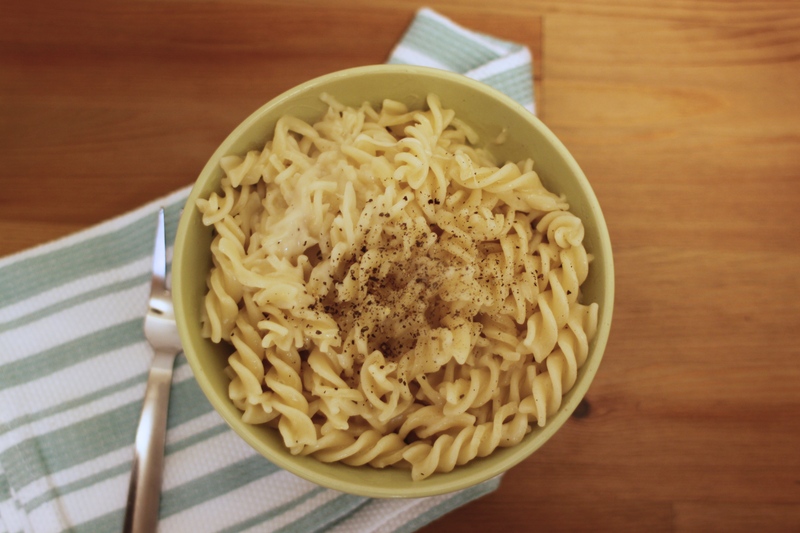 In the same pot, toss in the cubed butter, shredded parmesan, and cracked black pepper to leftover pasta water. 3. Stir sauce mix until slightly thickened, until you get a few strings of cheese – which signals that it’s time to stir the pasta back in. 4. Once the pasta is coated with the sauce, serve with freshly cracked black pepper.